In the previous post where I talked about "How Nigerian can make legit money online", one of the systems I described there was affiliate programs. What is affiliate program? You may ask. As I explained in that post, affiliate marketing is a type of marketing in which a business rewards one or more affiliates for their performance i.e. for each visitor or customer brought by the affiliate's marketing efforts. Affiliate marketing, one of the popular ways to make money online legitimately has four core players: the merchant i.e. the 'retailer' or 'brand' you are to promote, the network (a platform that contains offers for the affiliate to choose from and also takes care of the payments), the publisher who publish information related to the affiliate products to promote on his or her site (also known as 'the affiliate'), and the customer, who visits the affiliate site and is redirected to the merchant's site. Affiliate marketing is quite a complex marketing strategy, resulting in the emergence of a secondary tier of players, including affiliate management agencies such as CJ Conversants, OfferVault, to mention but a few, super-affiliates and specialized third party vendors. To become a Jumia affiliate you need to have a functional blog or website. With your blog or website, you can sign up for their affiliate program and start referring buyers to them by displaying products links and banners on your websites/blogs. When visitors to your blog click on the links/banners and make any purchase on Jumia website, you receive a commission for whatever they buy. When choosing products links/banners, you need to choose those products that are relevant to your audience i.e. the type of contents you have in your website. If for example, your blog is about phones and accessories, you should display links/banners on accessories related products, such as phones, computers, and the likes. When Jumia affiliate program started around 2013, it was powered by Commission Junction. Then the commission for any sale made was very encouraging, and I was able to make about $100 before they pulled out from CJ Affiliate Conversant. But by early 2014 Jumia started running the program by themselves and since then the commission was not as it used to be. It reduced drastically considering the fact that when it was run by CJ affiliates were paid in dollars. You know how much you can make if you convert ordinary $100 to Naira. Even though the commission is not as it used to be that does not mean you cannot make good money with affiliate program. You still can if you are hardworking and consistent. How much you make from the program depends on a lot of factors, such as how much traffic your site receives daily, what your blog is all about i.e. your niche, what you are promoting (they have different commission percentage for different categories of products). To make any tangible money from the program I suggest you write about information that has high search volumes, information that a typical Nigerian will be interested in so that when you share your links on social media you will have a lot of people come visiting your site. You can equally create a product review blog typically a niche blog where you select their products that are related to your blog and start promoting. Your blog readers will be interested in the product since they are interested in the information related to the products. 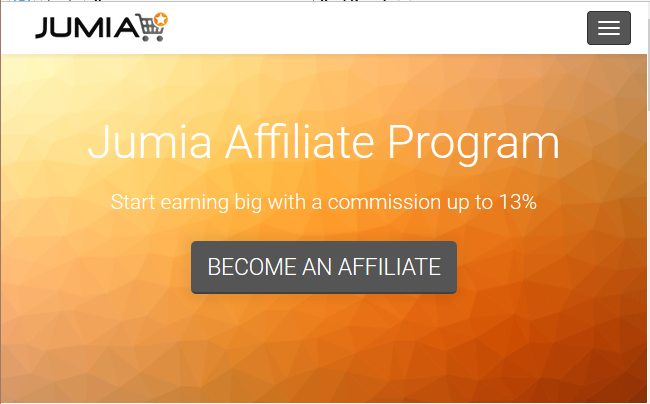 To learn more about setting up the account and other useful information, here is a link I found useful "Ultimate guide on how to make money from Jumia affiliate program. Check it out to learn more.